Box Text: Trouble? Call The Elite Beat Agents! Save the day by rocking solo, CO-OP, or head-to-head in the ultimate rhythm-action game! The fate of the world depends on your touch-screen skills as you jam out to 19 songs like "Material Girl", "Sk8er Boi" and "Y.M.C.A"! 01-24-2016 pacpix Box Text Trouble? Call The Elite Beat Agents! Save the day by rocking solo, CO-OP, or head-to-head in the ultimate rhythm-action game! The fate of the world depends on your touch-screen skills as you jam out to 19 songs like "Material Girl", "Sk8er Boi" and "Y.M.C.A"! 12-09-2012 artikskarab Box Text Trouble? Call The Elite Beat Agents! Save the day by rocking solo, CO-OP, or head-to-head in the ultimate rhythm-action game! The fate of the world depends on your touch-screen skills as you jam out to 19 songs like "Material Girl", "Sk8er Boi" and "Y.M.C.A"! 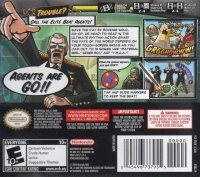 11-17-2012 arcaneknight Description Elite Beat Agents is the first english version of the popular Japanese music gameï¿½Osu! Tatakae! Ouendan. 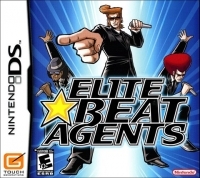 09-28-2011 kaizlu Description Elite Beat Agents is the first english version of the popular Japanese music game Osu! Tatakae! Ouendan. 09-28-2011 kaizlu Box Text Save the day by rocking solo, CO-OP, or head-to-head in the ultimate rhythm-action game! The fate of the world depends on your touch-screen skills as you jam out to 19 songs like "Material Girl", "Sk8er Boi" and "Y.M.C.A"! 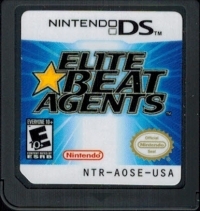 This is a list of VGCollect users who have Elite Beat Agents in their Collection. This is a list of VGCollect users who have Elite Beat Agents in their Sell List. This is a list of VGCollect users who have Elite Beat Agents in their Wish List.